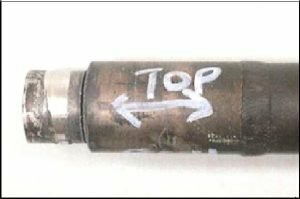 Several pigtail failures occurred on F901 Steam Reformer inlet and outlet header from 2007 to 2009 at Agrium’s Ammonia plant in Redwater, Alberta, Canada. 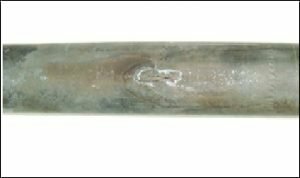 The inlet header pigtail failures were at a sharp shoulder on an Alloy 800 HT reducer. On the outlet header, an Alloy 800 HT pigtail failed by creep failure after 42,000 hours of service. This paper explains the cause of the failures, the follow up incident investigation and the actions taken to prevent recurrence of a similar failure. Agrium’s Ammonia Plant #2 is located near Redwater, Alberta, Canada and the plant produces about 680 KMT per year of ammonia that is used to produce urea, ammonium nitrate, sulphate and ammonium phosphate fertilizers. The plant was constructed by Bechtel Corp. and commissioned in 1982. The steam reformer is a two cell design with bottom burners, two rows of catalyst tubes in each cell, a down draft convection section installed between the cells with outlet ducting that connects to a pair of induced draft fans located at ground level. Gas turbine exhaust is used to supply preheat air for the primary burners. In 2004 the project “Purchase and Install F 901 Furnace Tubes and Headers” was completed that replaced the existing outlet headers, catalyst tubes, inlet and outlet pigtails. The inlet header and the outlet collector header were not replaced. A succession of failures occurred on the replaced components beginning in 2007 and ending in 2009. Figure 1: Failed reducer, crack is visible on the outside diameter at the root of the sharp shoulder. A failure analysis of the reducer on pigtail #81 was completed by a metallurgical laboratory and their conclusion was that cracking in the pigtail reducer was caused by a stress relaxation cracking mechanism. To reduce the incidence of this type of cracking they recommended a change to fine-grain Alloy 800 material. The reducer was a fitting that was machined from bar stock and the diameter reduction was not tapered but was an abrupt square edged reduction in diameter on the outside diameter and on the inside diameter. The mechanism of stress relaxation cracking is known by many names including strain-age cracking, stress induced cracking, reheat cracking, stress assisted grain boundary oxidation (SAGBO), post weld heat treatment cracking, and stress relief cracking. It occurs when an austenitic material, because of limited ductility, cannot withstand the inelastic strain imposed upon the material. It normally occurs between 500 and 750°C (930 to 1380°F). The temperature of maximum vulnerability is alloy specific. The temperature range of 593 C puts the reducer in the range where stress relaxation cracking can occur for 800HT, residual stresses from the welding and the stress concentrating effect of the change in diameter would all contribute to the cracking observed. There is an additional feature on this installation that added to the stress concentration in the area of the reducer. The inlet pigtail is designed as a circular loop that will allow vertical movement of the reformer tube under operation. The loop is the same diameter for its entire length except for the short small end of the reducer. The loop bending under the loads imposed by the expansion movement will concentrate at the small diameter location of the reducer. Piping flexibility analysis confirmed that bending stresses at the reducer were twice as high as the bending stresses in the rest of the pigtail loop. Future inlet pigtail design is to have uniform pipe thickness and diameter throughout and avoid the use of reducers. A short tube of alloy 800 pipe is still required to make the connection between the 304H SS section and the 2 ¼ Cr alloy header. The outlet pigtail design was changed from 1 inch sch. 160 Alloy 800HT pipe to 1 ¼ inch sch. 80 alloy 800HT pipe. On October 29, 2009 outlet pigtail #100 failed by creep failure after 42,000 hours of service. The failure was a longitudinal crack that was approximately 18 mm long. There was bulging seen in the failure area and the fracture appeared to be relatively thick walled. Figure 2: Failed outlet pigtail, crack is visible in the center of the pipe. The material is alloy 800HT and it is in creep service but a creep failure is not expected until at least 100,000 hours of service. An investigation was completed to determine the cause of the early creep failure. Metallurgical examination of the failed pigtail found significant growth in the outside diameter of the pigtail averaging approximately 6.1% compared to the nominal tube diameter. The tube inlet ends indicated no significant diameter growth. The conclusion was the pigtail failure occurred by creep. The root cause of the failure is not known although high stresses or temperatures are considered the main cause. The source of high stress or temperature could not be determined, meaning that the calculated stresses in the pigtail and the measured operating temperature would not explain the creep failure. Higher stresses and/or temperatures are required to predict a failure by creep in 42,000 hours for the pigtail material. A future design for the outlet pigtail would specify a design stress level equivalent to the 1981 design, the rationale being that this is the stress level that has proven 170,000 hours of service without a creep failure. This requires that future inlet pigtails will use Sch. 160 pipe instead of Sch. 80 pipe. To compare the primary stress levels (hoop stresses) the 2004 design had about twice the stress level of the 1981 design. There were four failures of the inlet pigtail reducer. The reducers failed by stress relaxation cracking due to residual stresses in the reducer from the machining of the reducer from bar stock. A contributing factor is the use of large grain Alloy 800 HT material, the large grain size being more susceptible to this failure mode in these service conditions. A second contributing factor was the sharp shoulders present on the reducer at the change in diameter area. Typically reducers, especially forged reducers have about a 1 to 3 slope on change in diameters. The final conclusion on the outlet pigtails is that we are not able to determine a scenario, within the normal operating parameters of the reformer furnace, which would have caused the premature creep failure of the pigtail. The future outlet pigtail design will be Sch. 160 thickness. Without any other factual information the recommendation is to return to the lower stress level in outlet pigtail design that was used in the original installation. The original pigtails operated for 21 years without a creep failure.